Unlike many designers’ didactic, X-meets-Y ideas as inspiration, Alessandro Michele leaves his work at Gucci open to multiple interpretations. It’s never about a specific era, a specific locale, a definite idea – rather, it’s a melting pot where the Chateau Marmont may meet Renaissance memento mori, a clutch of Scottish tartan and, say, Elton John in a Roman cemetery in Arles. That one actually happened, last May. What does it all mean? Michele wants you to decide for yourself. So while back in September Gucci’s Spring/Summer 2019 show was presented in Paris at the legendary Le Palace theatre as the final instalment of what the designer himself described as a “trilogy” of French-themed communications (including that aforementioned 2019 Cruise show at the Alyscamps in Arles, and the Pre-Fall 2018 campaign inspired by the May ‘68 Paris protests), it’s been entirely reimagined for their advertising campaign – exclusively unveiled on AnOthermag.com. Instead of France, for Gucci’s campaign we’re in Hollywood – Michele’s 70s Parisian echoes suddenly hark back to the 40s and 50s, and the all-singing, all-dancing incongruously music-punctuated movies of the period. Those are, of course, a reference the 70s mined ferociously: the decade’s patron saint Andy Warhol loved Marilyn Monroe, of course; while women of the period – Paloma Picasso, Donna Jordan, Jerry Hall, and Warhol’s Candy Darling – drew inspiration from the earlier era’s over-the-top elegance in their emphatic shoulders and slinky evening dresses. The Spring/Summer 2019 Gucci campaign is an homage to all of the above – to peroxide blondes, to glitter and glitz, tap-shoes and endless staircases to waltz up and down. For cinephiles, the knowing nods to, riffs on and winks at classics including An American in Paris (1951), The Band Wagon (1953), Cover Girl (1944), There’s No Business Like Show Business (1954), Gentlemen Prefer Blondes (1953) and Singin’ in the Rain (1952) are myriad. 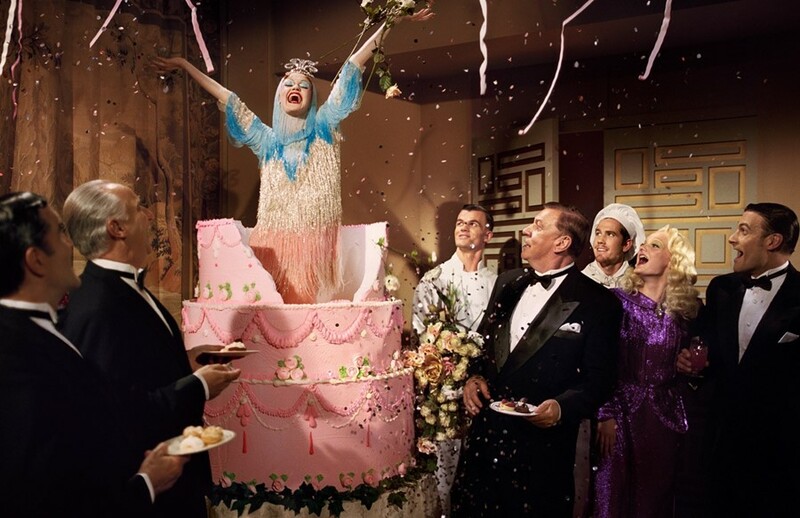 Creatively directed by Michele himself, the campaign is staged on an epic scale, photographed by Glen Luchford, who also creates an accompanying movie short – the soundtrack is Irving Berlin’s There’s No Business Like Show Business, of course. Another series of pictures further delves into the era, creating a series of tongue-in-cheek black-and-white portraits reminiscent of the perfected glossy images of matinee idols and screen sirens sent off to scores of adoring fans. Perhaps the theme was inspired, in part, by the theme of the upcoming Metropolitan Museum of Art Costume Institute show Camp: Notes on Fashion – Gucci is a key supporter of that exhibition. Camp, as Susan Sontag once memorably declared, is a woman walking around in a dress made of three million feathers – which is very Michele, and very Hollywood too. Michele himself told American Vogue “what camp truly means to me: the unique ability of combining high art and pop culture”. That’s just what Michele does not only in this campaign, but in all his work, time and time again – like no business I know. Creative director: Alessandro Michele. Art director: Christopher Simmonds. Photographer/director: Glen Luchford. Hair: Paul Hanlon. Make-up: Isamaya Ffrench. Images & Video: An American in Paris: TM & © Turner Entertainment Co. Singin’ in the Rain: TM & © Turner Entertainment Co. The Band Wagon: TM & © Turner Entertainment Co. Gentlemen Prefer Blondes: © 2019 Twentieth Century Fox Film Corporation. There’s No Business Like Show Business: © 2019 Twentieth Century Fox Film Corporation. Cover Girl: © 2019 Columbia Pictures Industries, Inc. All Rights Reserved. Video Music: There’s No Business Like Show Business by Irvin Berlin: © Berlin Irving Music Corp. Courtesy of Twentieth Century Fox Film Corporation.